5 3/4 x 8 7/8 inches, 72 pages of text, 44 color plates, 12 black & white plates. Order The Tourmaline at the same time and save $15.00. 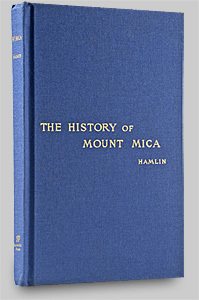 The History of Mount Mica was first published in 1895, by Augustus Choate Hamlin. The first printing was of 400 copies, but additional printings were performed with estimates of 800-1500 total books produced. The books were printed with a red, blue or green colored, linen cover. The original volumes are exceedingly rare, highly coveted, and most that have survived are in private and institutional collections. All of the artwork and drawings were done by Dr. Hamlin. This volume offered here is a reproduction, reprint of the original book, recreated as close to the original as feasibly possible today. Unlike the original, acid free paper is used through-out, so the collector will be assured of it's longevity and stability. Great care was taken on even the smallest detail. This text can be considered a companion book to "The Tourmaline," also authored by Dr. Hamlin. The History of Mount Mica contains greater details concerning the actual pockets and tourmaline specimens recovered during mining operations at Mount Mica by Dr. Hamlin. Actual specimens are chronicled in this book. The reader is also introduced once again to the notorious story of the discovery of this location. Hamlin's charming writing style captures your attention and you will never forget how the first tourmaline was found at Mount Mica. Dr. Hamlin has included in this book 44 color plates of tourmaline crystals he found at Mount Mica. These crystals were found while mining at this location prior to 1890. Dr. Hamlin is also the painter of these original images and we include one example here. Additionally, black and white plates and diagrams are included, some of which detail the actual mining map of the mine during his tenure of operations. Rubellite Press has taken great pleasure in bringing this treasure back to life!